He was a momma’s boy. Born piss poor in the poverty-stricken Deep South (Tupelo). He was also shy and fearful. His twin brother, Jesse Garon, was delivered stillborn. About a half hour later, he made his appearance on the world stage. His name was Elvis Aaron Presley. The date was January 8, 1935. 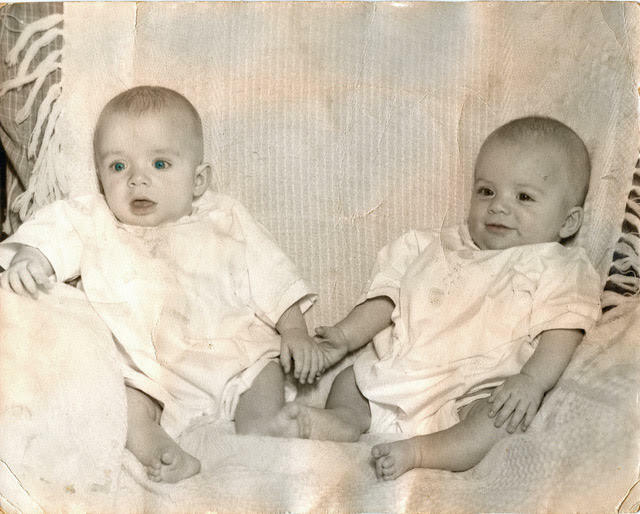 I, too, was a twin, but my entry into the world wasn’t quite that dramatic. I appeared a few years after Elvis, at the South Baltimore General Hospital, on Light near West Streets. Brother Jim said “hi” first to everyone. Then, after surviving a sharp kick from him to my right shoulder, (which he continues to deny to this day), I was able, slightly bruised, to introduce myself. It was the middle of “The Great Depression” and my Irish-born mom told the treating physician, Dr. Aaron Sollod, to put his bill “on the ticket.” That wasn’t a problem with the good doctor. He knew that when work picked up on the waterfront for my father, a member of Local 953 of the ILA, his bill would be paid in full. Also in the 50s, Bill Haley & his Comets were then dominating the music scene for the younger set with their popular fast dancing tune, “Rock Around the Clock.” Chuck Berry was in this mix, along with Little Richard, the off-the-wall Jerry Lee Lewis and the rhythm and blues man himself, the incomparable Fats Domino. In fact, I recall how we Locust Point boyohs went out to hear Fats and Little Richard, performing in a concert on April 5, 1956, at the now-defunct Baltimore Coliseum. These legendary recording artists were then at the top of their game. The arena, also used for sports events, was located at 2201 North Monroe Street. Growing up in the 50s, our favorite jitterbug dancing venue was called the “Advent.” It was located on south Charles Street, near Ostend. It was a church hall, and the younger crowds from both Locust Point and neighborhoods around the “Advent” enjoyed it. The music was played on a juke box. The hall on Friday nights was always packed with high-energy teenagers. The best jitterbug dancer out of that ILA Local 829 hall was a gang carrier, Larry “Perch” Holman. He liked to show off his talent around town, particularly in taverns that had a dancing space. One of his fave stops, as well as ours, was Sledge’s Bar in Locust Point. Getting back to Elvis. In the area of popular rock and roll, blues, country and gospel music, I submit there was no single entertainer – before and since – who embodied so creatively all four of these styles like he did. Vernon did a stint in prison for forging a check. When Elvis was eleven, Gladys bought him a guitar. (He was angling for a .22 rifle.) When they moved to Memphis, Elvis was thirteen. He loved gospel music and idealized black musicians, such as Muddy Waters, Sleepy John Estes and Arthur Crudup. They were his prime inspirations. Before stardom arrived, Mason explained Elvis was “self-conscious, awkward, nervous and often mumbled.” One day in the summer of 1954, he went into the office of Sun Records in Memphis to make a record for his mom. Elvis’s blazing star burned out in Memphis, TN, on August 16, 1977, at his beloved “Graceland.” He died much too young. He was only forty-two years old. Elvis’ daughter, Lisa Marie, was nine years old at the time of her dad’s tragic passing. In any event, Elvis’s tremendous, and often brilliant musical legacy, continues to live on in the memory of tens of millions of his grateful admirers around the globe, including me, and many of my boyhood friends from my Locust Point days. If you don’t know something, do some research. MI is Michigan, MS is Mississippi. Thanks Bill. Loved it. Poignant. As I’m a young baby boomer you are the previous generation to me. Your lot seemed more distant when I was younger but now that my own youth has begun to feel like yesterday it is somehow just the day before yesterday. Nice to get a bit closer.